Geneva, September 18, 2012 - STMicroelectronics (NYSE: STM), a global semiconductor leader serving customers across the spectrum of electronics applications, has revealed its next generation of secure microcontrollers for transport, banking and e-ID applications. The secure micros leverage ST's advanced 90nm manufacturing technology to enhance security and support for preferred smartcard standards in major territories worldwide. The devices are currently the only secure microcontrollers in the market offering the ability to distinguish between ISO 14443 Type-A or Type-B contactless readers automatically and respond using the correct protocol. This dual-protocol flexibility allows ST to target important markets worldwide, offering customers the convenience of creating one software application that can be used with either standard. 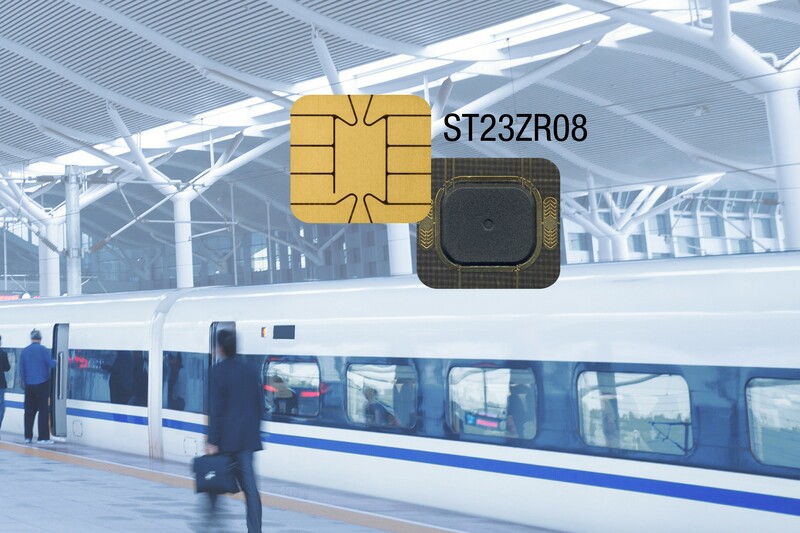 Mass transit, e-payment or e-ID cards using ST's latest chips will also offer extra convenience for users by operating smoothly with any installed reader including older, single-protocol types. ST's new ST23ZR family of secure microcontrollers comprises dual-interface devices supporting both ISO 14443-A/B contactless protocols, as well as the ISO 7816-3 standard for contact-type cards. The chips also support the Calypso and Tmoney e-ticketing technologies used in numerous mass transit systems worldwide. In addition, the ST23ZC family provides purely wireless communication for contactless-only applications. "With the unique ability to detect type A or type B readers automatically, our latest devices support innovation in card services such as seamless roaming between transport networks in territories using different reader standards, " said Christian Vignes, Personal Security Business Line Manager, Secure Microcontrollers Division, STMicroelectronics. The recent hacking of memory-based transportation cards has increased the need for security and encouraged a migration towards more secure microcontroller-based transportation cards. Countries such as Korea or China have chosen to migrate their transport network from established memory-card solution to secure microcontroller chip cards, creating a significant market opportunity for the newly CC EAL5+ certified ST23ZR/ZC secure microcontrollers from ST.
ST has incorporated all the latest card-security concepts in its new secure microcontroller devices, taking the same approach as with the high-end secure processors for banking and passport controls. Unlike competing chip-card products that implement software-based security, ST's secure microcontrollers use tamper-proof hardware to execute robust security algorithms such as Triple DES (3-DES) and AES 256. Faster operation is another benefit of this hardware-based security model. All ST23ZR/ZC devices are qualified to demanding government and credit-card security standards including Common Criteria EAL5+ and EMVCo, assuring resistance against threats such as fraud and identity theft. Both the contactless and dual-interface families offer up to 8 Kbyte on-chip EEPROM memory for user data. Samples of ST23ZR08 dual-interface and ST23ZC08 contactless chips are available immediately, under NDA. They can be supplied in unsawn wafers, micromodules, or as sawn die. These products are intended for use in secure applications under NDA, and are not available through distribution. For further information, including pricing, please contact your ST sales office.